The first Artists’ Studio Tour began in 2002 with 11 artists. It has grown yearly having accommodated more than 125 artists, skilled in numerous disciplines and a myriad of styles. First and foremost, to provide an opportunity for local artists to present their work directly to the public and to promote the purchase of locally created quality artwork. The Tour offers them a way to become a visible part of their community while bringing about an awareness of the contributions artists make for the betterment of the Town of Saugerties. Second, to educate and introduce people to a wide variety of artwork and to inspire students to continue to express themselves and develop their skills. Fourth, to work with the Town and Village of Saugerties as partners in economic development where the arts help drive the local economy and Saugerties becomes identified as an arts destination. The Tour is a sub-committee within The Saugerties Hudson River Partnerships, Inc., a 501(c) 3 not-for-profit. It is made up of volunteer member artists, each lending a hand wherever they can to organize, promote and make the Tour into the successful event it has become since its inception. We are committed and love what we do. Each artist in his or her own right is dedicated to the pursuit of their art. The Tour features a wide range of artists with varied skills that include: painting in all its manifestations including oil, acrylic, watercolor and encaustics along with drawing, mixed media, photography, digital, sculpture, fine furniture, printmaking, ceramic art and pottery, mosaic, collage and bricolage, wearable upcycled art, cartooning and neon. Each artist has their own unique voice and life experience to share. Some of the artists’ are renowned with credits to their names from exhibits locally, NYC and worldwide. All of our artists are talented and many are yet to be discovered. 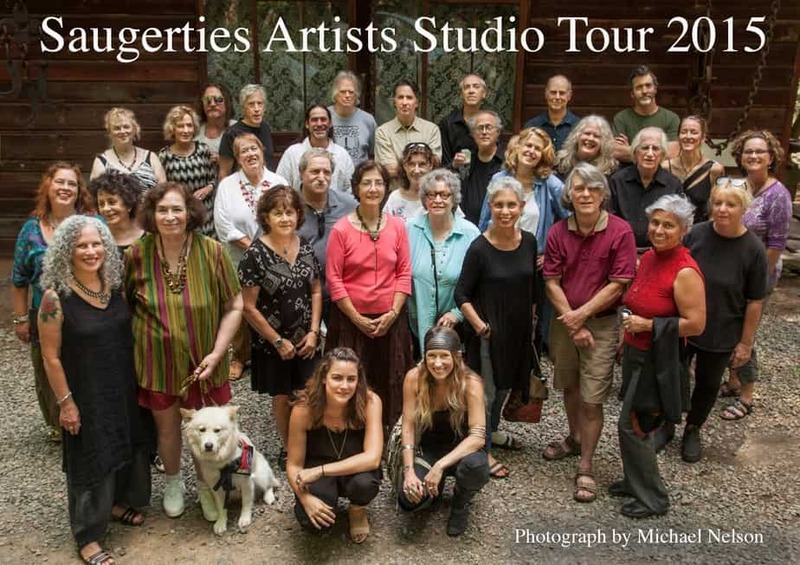 The Tour, a free self-guided event that takes place throughout the entire Town of Saugerties at the private studios of the participating artists, kicks-off on Friday, August 12, 2016, with a reception and group exhibit at the gallery at Opus 40 Sculpture Park in Saugerties. This exhibit’s primary goal is to introduce the artists and their work to those attending and to stimulate interest for visiting the studios during the open studios weekend on Saturday and Sunday, August 13 and 14. This is an event not to be missed and it grows in popularity each year setting an upbeat tone and excitement about local art and artists. On Saturday and Sunday, August 13-14, studios throughout the town will be open from 10 a.m. to 6 p.m. and will be staffed by the artists. The Tour benefits both the artists and the public through their interaction in the place where artwork is created, and gives the artists an opportunity to express their motivation, inspiration and development. At all the studios visitors will see finished work and works in progress. In many of the studios artists will do demonstrations and some will offer hands-on experiences for visitors.